Light Industry presents Issue 4 of the pioneering videocassette magazine Infermental. The issue will be shown in its seven-hour entirety and introduced by James Richards, who recently edited the publication A Detour Around Infermental with George Clark and Dan Kidner. 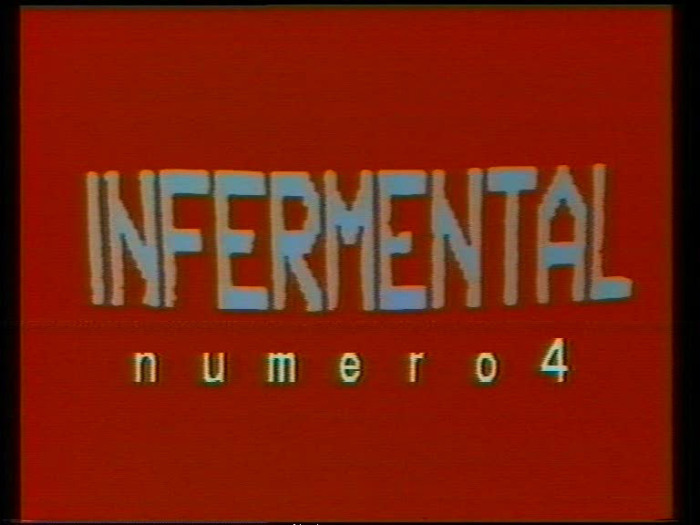 Infermental, the "first international magazine on videocassettes," was initiated in 1980 by Gábor and Vera Bódy, and eleven issues were published between 1980 and 1991. The early installments were realized with boundless energy and a visionary zeal—Gábor Bódy’s idea was to build an “Encyclopedia of Recorded Imagery." He produced the first edition while on a DAAD residency in Berlin, and each subsequent issue was put together in a different city. Beginning in Europe, and with a distinct focus on connecting video and other media artists in the East and the West, Infermental became a project with global reach when later editions were produced in North America and Japan. Each issue featured between 30 and 100 artists contributing complete films, excerpts, trailers, interviews, and performance footage, and was assembled by a different editorial team, normally consisting of two former contributors and one supervisor. Though Bódy, the publication’s figurehead, died in 1985, Infermental continued for another six years. Over the course of the project’s life, a diverse range of influential figures contributed to the magazine, like Peggy Ahwesh, Martin Arnold, Dara Birnbaum, Tony Conrad, Manuel de Landa, Diedrich Diederichsen, Juan Downey, Peter Hutton, Joan Jonas, Józef Robakowski, Steina Vasulka, and Lawrence Weiner. But it was the less familiar names, the editorial rationale, the innovative distribution strategy, and the exhibition model that made it such a fascinating and enduring enterprise. Enabled by the newly accessible technology of U-matic cassette tape, Infermental brought together a number of formats, including 8mm, 16mm, and 35mm, as well as video. The editions were sold or rented to institutions with specific instructions for their presentation: the tapes were to be played one after the other for the full duration of the issue. Given the relatively peripheral status of video at this time, and the broad lack of support from galleries and film festivals, Infermental attempted to find a new way to present and circulate work among artists and institutions around the world. Issue 4 was edited by the French artists' group Frigo in 1985 and marks a shift in the magazine's editorial policy, drawing on the group's multi-disciplinary activities, collective organization, DIY ethos, and experience in pirate radio. Authorship is thrown into disarray as amateur footage, artists’ films, ethnographic documents, video performances, and music videos are seamlessly edited together. James Richards lives and works in London. Solo exhibitions include a residency at CCA Kitakyushu, Japan (2012); Chisenhale Gallery, London (2011); Rodeo Gallery, Istanbul (2011); Art Now (with Clunie Reid), Tate Britain (2010); Tramway, Glasgow (2009) and Swallow Street, London (2009). Recent group exhibitions include Frozen Lakes at Artists Space, New York (2013), Younger than Jesus at the New Museum, New York (2009) and Nought to Sixty at ICA London (2009). Richards has curated film programs and screenings at Serpentine Gallery, London (2010); BFI, London (2010), X-Initiative, New York (2009); and Whitechapel Gallery, London (2007). He is the recipient of the 2012 Jarman Award. Tickets - $7, all-you-can-watch, available at door. Stop in for an hour, come and go, or stay all day. Please note: seating is limited. First-come, first-served. Box office opens at 2pm.